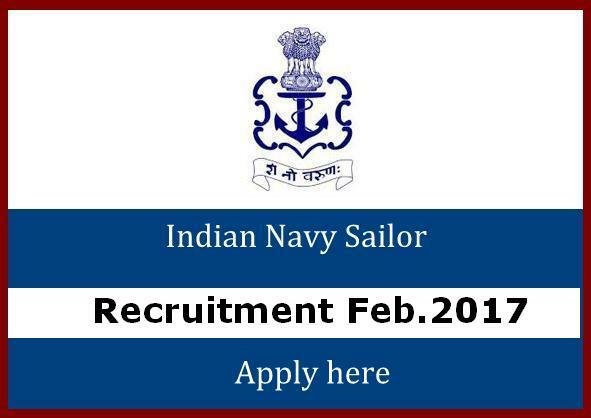 Indian Navy has published a Advertisement for below mentioned Posts 2017. Other details like age limit, educational qualification, selection process, application fee and how to apply are given below. Educational Qualification : 10+2/ equivalent examination with 60% or more marks in aggregate with Maths & Physics and at least one of these subjects: - Chemistry/Biology/Computer Science. Age Limit : Candidates should be born between 01 Feb 1997 to 31 Jan 2000 (Both dates inclusive). Grade Pay @ Rs 2000/- plus MSP @ Rs 2000/- plus 'X' Group Pay @ Rs 1400/- plus DA.